The cannabis market experienced two full boom and bust cycles in 2018 and produced many spectacular bubbles. We will discuss four biggest cannabis bubbles: IGC (100% loss after delisting), Pyxus (77% loss), Aleafia (70% loss), FSD Pharma (70% loss). Investors should be extra careful when businesses announce sudden changes or claim to operate ancillary cannabis businesses. Good luck investing and stay away from cannabis bubbles in 2019! Welcome to our Cannabis Industry Analysis where we analyze the latest and hottest topics in the industry to help you stay ahead of the curve. The year 2018 marks one of the most dramatic and volatile for the cannabis sector. The sector experienced a huge rally in late 2017 before sinking into a deep recession for the first half of 2018. The Constellation (STZ) investment into Canopy (OTC:CGC) kicked off another round of pot frenzy in late August and stocks. Despite general market volatility, there are several stocks that can be described as bubbles as a result of rampant speculations, questionable management, and the general irrational exuberance in the market. India Globalization Capital (NYSEMKT:IGC) was hands down the biggest cannabis bubble of 2018. The stock had repeatedly pivoted towards the "hottest" topic by making superficial announcements without substance. 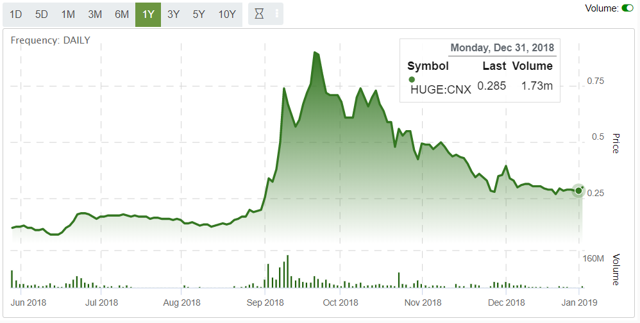 After the stock announced that it is developing a line of CBD-infused energy drinks called 'Nitro G', its shares erupted and reached their 52-week high of $14.58 in October. To put into perspective, when Constellation announced its Canopy investment on August 15, the shares of IGC traded at $0.40 per share. When the stock reached its all-time high of $14.58 in early October, it had gone up 36 times in a matter of fewer than two months! We discussed the situation in "Is IGC The Biggest Cannabis Bubble After Its 1,000% Gain?" and warned investors to steer clear of this bubbly stock. All bubbles come to an end, and IGC was no exception. On October 29, NYSE announced that it has delisted IGC citing violations of the listing rules and unethical management behaviors. The stock will be worthless for any greedy investors that still hold it at the time of delisting, and we believe IGC is definitely one of the most spectacular cannabis bubbles of the year. Pyxus (PYX) reached its 52-week high of $52.43 on the back of a slew of announcements on entering the U.S. hemp market. We published our first analysis of the stock, "Pyxus: Will This Tobacco Stock's Pivot Into Cannabis Succeed? ", in which we detailed our reasonings as to why Pyxus is not a good way to play the cannabis sector and its ambitious cannabis plan has many holes. The stock went on to lose 77% of its value from the 52-week high, and we once again reviewed the situation for our readers. Pyxus first made its cannabis related investments on February 9, 2018, when it acquired a stake in two small Canadian licensed producers in PEI and Ontario. The stock was trading at $13.00 per share before the February announcement, and it has fallen to $11.86 as of December 31. What a spectacular rise and fall. We first introduced Aleafia Health (OTCQX:ALEAF) to our investors in "Forget About Tilray, This Cannabis Stock Gained 300% In A Month" after the stock's meteoric rise caught our attention. After looking into the stock and the company behind it, we came away disappointed. 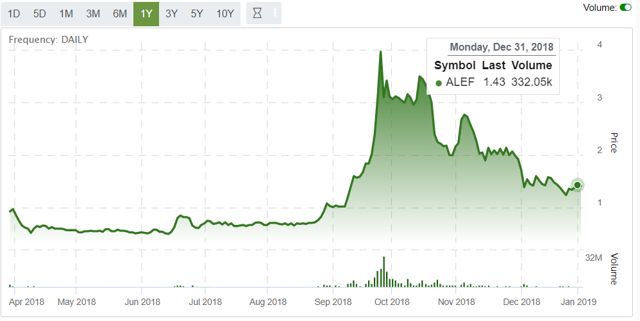 We couldn't find any evidence to suggest that Aleafia has any competitive advantage over its peers and recommended investors to stay away from the stock. The company recently announced the acquisition of another small Canadian company Emblem (OTCQX:EMMBF) which we think carries a high deal risk due to dwindling premiums and a lack of strategic alignment between the two companies. FSD Pharma (OTCQB:FSDDF) was a small-cap Canadian cannabis company that rose the wave in August to an all-time high of $0.94 before falling back to $0.285 on December 31. We recently discussed why the stock was such a bubble from the beginning in "FSD Pharma: Trying To Run Before It Can Walk". We continue to believe any management that exhibits highly promotional and misleading investor communication strategies should be avoided. The cannabis sector is a nascent industry with many bad actors out there. Investors need to discern bad management, which is very difficult to do, and bad things could happen with seemingly credible and experienced management teams such as those at Aphria (OTC:APHA). FSD Pharma has a questionable business plan, and we are happy that the market is finally waking up to it. There have been many other companies that were affected by the boom and bust of the cannabis sector. Coffee/tea chains DAVIDsTEA (NASDAQ:DTEA) and Second Cup (OTC:SCUPF) all experienced irregular trading during the last year, and we have analyzed some of these situations in the past. Sudden pivot to cannabis: When businesses declare their entry into cannabis all of sudden and the market reacted overly positive to the announcement, there is a high chance that the stock is overheated. Usually, these companies are struggling in their existing business and desperately need to find a way out. In the case of Pyxus, its tobacco business is facing significant headwinds, and management is desperate to find another growth area, and the market was overly optimistic. Ancillary businesses: Cannabis is a nascent industry that is exploding into a multibillion-dollar industry. Many businesses are trying to attach themselves to the word "cannabis" such as IGC. Investors need to be very careful when companies claim to be operating in ancillary businesses that relate to the cannabis industry. Popular areas include cannabis-infused beverages and edibles. We discussed New Age Beverages (NASDAQ:NBEV) and its cannabis drinks announcements here.